With over 10 thousand users nationwide, SX3 Loan Modification and Short Sale is the industry standard. Fastest database in its class. via your existing LAN or remote server via Internet with zero down-time. No software program can match the features and speed of SX3. Track & Bill time per case. Track and bill time spent on each case, per user! After working on a case, users decide if the time spent will be registered and automatically billed based on the Client's Rep. Agreement, integrating with the billing system. Plus HUD-1 Form with 1 click! SX3 Loan Mod & Short Sale allows you to know if your Client is Pre-Qualified for a Loan Modification or if the Net Present Value Test (FDIC) Passes or Fails! Complete pipeline control via SX3 pipeline management system. Specify the different statuses (and tasks per status) of your leads, cases and archived files. Generate benchmarks and milestones reports with one click! SX3 Loan Modification & Short Sale Software. "The fastest, most powerful and complete software developed for the Loan Modification and Short Sale Industries just got better. Introducing SX3 Loan Modification & Short Sale Software Version 8.0"
Updated with the most recent changes to the Government Programs and Regulations. Discover why SX3 is the Industry Standard. Loan modifications and Short Sales are now well regulated businesses, with clear rules that have provided Attorney firms and private Loan Modification companies the ability to be profitable business ventures. Well organized Attorney Firms and Loan Modification Companies can provide the case management, negotiation and the required tracking during the process of a Loan Modification or a Short Sale while using SX3 Loan Modification and Short Sale Software. Homeowners are more educated and cautious when selecting a Company or an Individual to represent them; this is why you must be prepared to deliver results, update your customers timely, submit documents as required and demonstrate that you are really taking care of your Clients in case of an audit. Only SX3 Loan Modification & Short Sale Software can deliver what you need when you need it. SX3 Software has reached the impressive milestone of ten thousand users nationwide, an undeniable prove of the reliability and quality of our software applications. In addition to government regulations, our customers base allows us to keep our applications up to date by attending to our customers suggestions. Don't trust our word, ask your competitor. Windows based license: you own your data, you host it! We can install your application on a laptop for individual use, a regular PC, standalone server or a remote server to enable remote/internet based access. Unlimited Loan Modification and Short Sale cases. Powerful database, tested with 10 million cases. Visual representation of the Home Affordable Mortgage Program HAMP & HAFA. Determine, during the initial interview, if your Client is Pre-Qualified for a Loan Modification, if the NPV Test passes or fails and generate the mortgage payment waterfall calculation based on the HAMP Guidelines, with just one click. Management of negotiations with "topics" selection and "canned" notes. Preloaded with Application Forms of the top lenders that auto populate your clients information. Generate the SX3's unique professional Loan Modification or Short Sale Proposals. Present your own Loan Modification or Short Sale proposal to the Lenders. Track the time spent on each case with details of name of user and duration of each session. Bill the time with the automatic billing function. Create "Attorney Users" that can see their cases even when they come from different branch offices/processors. Generate reports. Your Clients can track the progress of their cases via your own existing website. Now you can really manage your cases and keep them organized. With a complete workflow that you can configure and SX3's end-to-end CRM application developed for the Loan Modification and Short Sale Industry. Unlimited Branch Offices/Affiliates and unlimited Attorneys. Manage, group, filter your cases easily. Provided preloaded with industry standards. Customize and automate your own Documents & Agreements*. Easily edit your actual documents with Microsoft Word (not provided) and convert them in templates that auto populate your Clients info. Customize your services catalog, add multiple types and specify different commissions. Accounts Receivable - Payments scheduler - Payment receipts - Collection Reports. Accounts Payable - Control of Agents - Control of different types of commissions. Scan/Import and manage your Clients' documents directly into the application. Email or eFax the entire Loan Modification or Short Sale package "directly" to the Lenders! Detailed cost of repairs module. Financial Statement module with 3 scenarios and report generation. Assets and Liabilities module and report generation. Automation of Hardship Letters with hardship macros. Control of appointments thru the appointments module plus Microsoft Outlook interface (optional). Multi users with detailed user rights and data access specification. Establish access restriction per user. Specify access to reports per user. Compatible with www.Signa2r.com E-Signature service (optional). Import your Clients data from any other software or source. English & Spanish software interface selectable per user. Provided with live-online "private" training. Professionally developed, very easy to use "user interface" with a short learning curve. Software designed by professional software architects, following window application standards. Implementing a web (internet) based application could be a painful experience if you lose connectivity to your web server, or your web hosting company loses your data due to an "unexpected" system crash. We offer server based (windows based) software that is installed on your computers in your office (remote access can also be implemented). We will deliver your software in less than 30 min after you purchase it and we can install it on your local or remote server in 1 hour. With SX3 Loan Modification & Short Sale, you own your license and you own your data. In the last 10 years, we have seen many Companies lose all their data (with all their privileged information) due to the lack of professionalism by their web hosting companies to maintain a professional-level data center. This is one more of the reasons why Attorney based offices will never use web-based applications for their relevant systems. Server based applications are not only faster and more feature rich but also more secure! Implementing new software a web (internet) based application could be a painful experience if you lose connectivity to your web server, or your web hosting company loses your data due to an "unexpected" system crash. The Industry's most complete & professional HAMP "Qualifier" tool available! SX3 Loan Modification & Short Sale Software offers the industry’s most powerful and complete step-by-step loan modification client pre-qualifier available. With this powerful tool, you can determine within minutes if your Client is pre-qualified for HAMP, HOPE, HAFA & HARP. No more guessing, using incorrect values or half of the Governments requirements. SX3's pre-qualifier uses the FDIC NPV (Net Present Value) Analysis and takes into account all the guidelines of the HAMP/HOPE/HAFA program and walks the user through, making sure the user gets the correct results. Everything in the same module, under the same set of screens, guiding the user step-by-step towards the HAMP process! If you have not purchased the SX3 Loan Modification & Short Sale Software yet, don’t believe just what you read!, call us today or send us an email and we will demonstrate “Live” how powerful and easy to use this software is. Will my Client pass or fail the the NPV Test? Does the Homeowner pre-qualify for HAMP? Does the Homeowner pre-qualify for a Refinance Program? Does the Homeowner pre-qualify for an extension of the mortgage term to 40 years? Does the Homeowner pre-qualify for the new Home Affordable Foreclosure Alternative program? What will be the estimated homeowner's new interest rate? How much money is the homeowner estimated save with a Loan Modification? Is the price of the property qualified under the HAMP guidelines? Complete management of Leads (CRM ), don't lose track! We have found that one of the main problems that Loan Modification and Short Sale Companies are facing is the way to originate (capture) more Leads. In many ways, this problem is caused by a poor management of the inbound calls and follow up of prospective clients. Black: files in black do not require immediate attention or follow up. Red: files in red are due for follow up. Every time you schedule a phone call or an appointment, SX3 Loan Modification and Short Sale software will display it in red. When the scheduled action is due, the system will change the color of that lead automatically. By the end of the day, supervisors should not see many red leads as Sale Reps. open them and perform the follow up action, scheduling the next call or meeting. The foreclosure date of Lead A is Nov-15th. The foreclosure date of Lead B is Nov-16th. If you configure SX3 Loan Modification and Short Sale to highlight cases with foreclosure date in the next 15 days and today is November 1st, only the case A will be highlighted. On November 2nd, SX3 Loan Modification and Short Sale software will also highlight Lead B. Once you put this tool into action you realize how fast an accurate you can control if your Sale Reps. are doing their job. Generation of SX3's unique Professional Loan Modification Proposal with one click! One of the main objectives of our Loan Modification and Short Sale software is to generate a professional looking, very complete and convincing Loan Modification proposal. Once you enter the necessary information like mortgage info and financial statement (current and proposed scenarios), the system can generate the Loan Modification proposals for the 1st and 2nd Lenders showing detailed aspects of the current and proposed situations. Current Vs proposed mortgage information. Current Vs proposed financial situation, income, mortgage payments, PITI and deductions. Current market value (CMV) analysis. Cost to secure the Property. Foreclosure price and Est. Sales Price. Sales (loss) proceeds to Lender. With the "unique" SX3 Loan Modification and Short Sale Proposals you can clearly and aggressively show the Lenders the benefits of accepting a Loan Modification or Short Sale scenario favorable to your Client. All the forms in the system can be previewed, printed, exported to Adobe PDF or sent by email or eFax directly to the Lender! Generation of SX3's unique Short Sale Proposal with one click! Didn't get the Loan Modification Approved? Does the homeowner prefer to do a Short Sale? With SX3 Loan Modification and Short Sale software it is very simple to generate the HUD-1 Statements for your Clients. Simply enter the main values that are required and the software will generate this form populating the values you entered and making the calculations for you. Being able to generate the HUD-1 Statement is a must-have feature if your Company offers Short Sales. Additionally to this, SX3 generates a unique Short Sale Proposal that outlines the benefits of accepting the presented short sale instead of an REO or a Foreclosure. (Front and Back End DTIs). With the announcement of the Home Affordable Mortgage Program, the calculation of Front-End and Back-End DTIs became a key element in the Loan Modification and Short Sale process. SX3 Loan Modification and Short Sale offers the most advanced and convenient representation of the PITI (Payment Interest Taxes and Insurance) and DTI (Debt to Income). This presents a unique opportunity to visually understand your Client's financial situation. Another unique feature offered in SX3 Loan Modification and Short Sale Software is the multi-scenario Financial Statement. 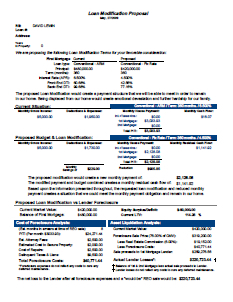 This feature allows you to enter your Client's Actual financial situation, an additional resulting scenario after a proposed Loan Modification and another resulting scenario after a Short Sale; this tool allows you to present to your Client the different options and visually appreciate how the graphics change based on the values entered on the worksheet. Select the lines part of the Front and Back End DTIs. Specify Borrower and "Spouse's" Income, Deductions and Expenses in separate lines. Enter comments (notes) for every line of the Financial Statement. 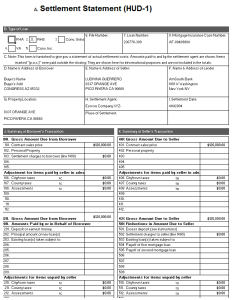 Select/Configure Printer from the Financial Statement window. Within the new module you can now discriminate between Borrower and Co-Borrower's Assets and Liabilities. Select/Configure Printer from the Assets and Liabilities window. One of the most recent regulations is the requirement to involve an Attorney in the Loan Modification process to represent the Client (homeowner). Time tracking and billing: Track the time spent on each case with details of name of user and duration of each session. Bill the time with the automatic billing function. Create "Attorney Users" that can see their cases even when they come from different branch offices/processors. Generate reports. Catalog of Attorney Offices: this feature allows the Administrator to register an unlimited number of Attorney Offices an associate them to the different cases in the system. Case notes by Attorney: users can identify the negotiation notes as "Lender", "Attorney" or "Home Owner" related. This offers the opportunity to filter and list notes by Case and Attorney as needed. Online access to cases per Attorneys: the Corporate Web Component (sold separately) allows the Attorneys to access their Loan Modification and Short Sale cases online. Attorneys can see the list of their current cases and click to see further details and related information. If a Client calls in for an update, how fast can you provide the information? What if the Negotiator is not in the office, can you still provide the feedback required by your Client? With the flexible detailed reporting features built in SX3 Loan Modification Software you can easily find a case (using the on screen filtering) by name, address, loan number or any telephone number, then all you need to do is to open the case. All the information and notes about the negotiations are available. Additionally to these features, we also offer SX3 Web Component which allows your customers to go online and using the user name and password that you provide, they will be able to log in and check the progress of their cases. Control of negotiations and reporting for audits. SX3 Loan Modification and Short Sale software provides a very complete, safe and easy to use control of negotiations. Every time your Negotiators contact a Lender, an Attorney or a Customer, they are able to register notes, when the notes are saved SX3 stamps the time, date, the user who entered the note and the type of note. Notes entered in a Case cannot be deleted or modified unless the user account has been authorized to do so; this offers a high level of security in companies where Branch Managers or other users are granted access to the same Case. Notes marked as "Borrower-Online" are accessible from your Company's website via internet (SX3 Web Component required); your users can log into your website with a user name and password that you specify and they can get to see the progress of their case, balance, documents presented or missing, notes and more, additionally the template of the online form can be modified using an HTML editor to include your logos and brand colors. SX3 Loan Modification and Short Sale software has several reports that can be used to update your clients or can be presented to a regulatory agency in case of an audit. These reports can be sent by eFax or email directly from the application. This feature allows you to create Remote Offices, Branches, Independent Attorney Offices working in association with your Firm or Independent Loan Modification & Short Sale Affiliates. With this set of features, users can easily configure representation agreements "per Branch Office" which allows the use of different Company names, contact information, logos, etc. If your Company has branch offices or is doing backend processing for other firms, this set of features is ideal for you; it offers all what is needed to manage your distributed pipeline with enhanced data access security and flexibility. The users setup module allows the Administrator to associate users to Branch Offices and at the same time, each Branch Office may contain unlimited "Users Groups", this offers the opportunity of controlling access to cases by Group/Branch. You can create "Attorney Users" that will be able to see all the cases assigned to them even when they are being processed at different branch offices. SX3 Loan Modification and Short Sale network infrastructure allows Administrators of small, medium or large Companies to not only oversee but to manage in detail what each user can "access or do" through the system. Administrators can grant/deny access to modules, functions and reports of the program. This allows the Administrator to create Branch Offices and Users Groups per branch, Branch Managers, Regular Users and Attorney Users enabling "collaboration" and limiting (if required) the access to cases. Under each Branch Office, when you create user-groups you can specify if a given user can access only his/her own documents or if he/she can also access the cases of all those other users members of his/her user group. You can also specify if a user can access all the cases of a branch or all the branches. Some other features include adding/editing/deleting payments from Customers, payments to Referring Agents, Adding/Editing/Deleting Service fees and much more. The following screen shows the different levels of access to cases. This can be easily setup per user from the users module. Own Cases only: the user can only see his/her own cases. Cases under my Users Group: the user can see all the cases of other users under his/her same User's Group. 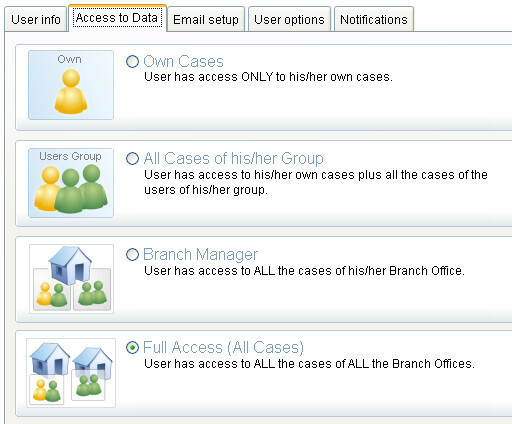 Cases under my Branch Office: the user can see all the cases of the users under his/her Branch. All the Cases: the user can see all the cases registered in the database, for all the Branch Offices. Using the SX3 Loan Modification and Short Sale Repairs module you can enter as many repair-lines as required; these repairs are summarized and automatically presented as part of the Loan Modification and Short Sale proposals. You can also generate a repairs report that can be emailed and eFaxed directly to the Lenders. SX3 Loan Modification and Short Sale is an applications that can be adapted attending to your own business needs. From the Docs and Agreements module you can create as many customized document templates as needed (and in multiple languages). In every document you can insert the corresponding macros (tags) like [Client_Name] or [Loan_Number] which are replaced with the correct information from the Client's file when the documents are generated. All you need to do is to edit your actual docs in MS Word and insert (copy and paste) the corresponding macros replacing the different fields like the name of the Client with the [Client_Name]. As soon as you enter the Lead's information in the system, all the contracts (Docs.) can be automatically generated, populating (replacing) the macros' content with the content from the open file. SX3 Loan Modification and Short Sale software is provided with a preloaded list of documents related to the Loan Modification and Short Sale industry but you can always create an unlimited number of documents customized to your needs. Control of Appointments / MS Outlook Integration. Every time you enter/modify an appointment in SX3, if you select the option to synchronize, it gets updated in your MS Outlook as well. This way, you can keep everything updated, personal and work appointments. This powerful feature allows your entire team to effortlessly synchronize their appointments in SX3 Loan Modification and Short Sale software with their Outlook accounts (a license of MS Outlook is required on the station for this feature to work). You can also sync your appointments with your MS Outlook compatible mobile phone! Don't miss an appointment or Creditor's follow up call again; this new feature allows you to take all scheduled activities with you on the road. Every time you create or modify an appointment in SX3 Debt Settlement, it syncs with your MS Outlook account so you can keep everything together and receive mobile and on screen alerts. This feature is only available in the version 1.5 of the SX3 Debt Settlement Software. SX3 Debt Settlement is the most powerful and feature-reach software developed for the Debt Settlement Industry. Call today for information and a free "private" live online demo. Now you can keep "everything" together, with the MS Outlook integration from SX3 Loan Modification 4.0. Customizable pipeline statuses and tasks. We offer our unrivaled pipeline management system. This set of features provides a complete solution to manage your pipeline; from the specification of each "Case Status" down to the list of "Tasks per Status" and instructions for your employees. You can outline your business model, determine the statuses that a case must go thru through the pipeline plus the tasks that must be completed under each status. These tasks are automatically assigned to each case with a number of days for completion. 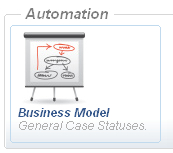 The SX3 Software's business modeling feature is unique in the Loan Modification and Short Sale Industry; when combined with the reporting capabilities (Cases per Status, past due tasks per users group, branch, etc) it offers true control of your processes. Customizable Service Catalog with multiple types of commissions. For every service you define in your catalog you can specify a different commission schema. You can select multiple services per case. Service names can be automatically inserted in the forms, contracts and agreements. You can generate reports by type of service like "Open Loan Modifications", "Short Sale by City or State". If in the future you need to create new services, you can do it yourself or contact our tech support department. SX3 Loan Modification Software and Short Sale software allows you to easily schedule multiple payments per case. All you need to do is to specify the number of payments, dates and the amount of each payment. The system will show you "on-screen" alerts as well as reports of scheduled collections between dates with parameters to filter the results. Every time you receive a payment, you can enter it in the application and it will generate the receipt, with your Company's name and logo and will update the database with the new balance. Easy, convenient and secure. Only authorized users can receive payments and print out payment receipts. John Bates receives $350 per case. Michael McDonald receives $450 per case. Christina Santiago receives $480 per case. Generate (printout) the commission checks and control the balance of each Agent. Allow the Agents to log into the application to review the progress of "their" referred cases. Generate multiple reports per Agent with multiple parameters to filter the result. When you are closing either a Loan Modification or Short Sale case (you reached an agreement with the financial institution), you can enter values like new mortgage amount, new APR & new term (after negotiation). Having on file the original values (prior to negotiation) it is easy to generate statistic reports that are a very efficient sales tool. With statistic reports generated from SX3 Loan Modification and Short Sale software you can show your prospective Customers how much money you have saved to a given number of Clients in the last "n" months. You can generate reports that show cases close under the Home Affordable Modification Prorgam (HAMP) or thru other Lenders. These same reports can be used during an audit by a regulatory agency to demonstrate the effectiveness of your Company. Since you have the ability to scan all the docs. directly into your SX3 Loan Modification and Short Sale database, the entire case can be easily sent via email to the Financial Institution. Insert macros in the subject and body of the email with simple mouse clicks (like Client's Name, Loan Number, Address, etc) which are replaced with the information from the Client's file. Specify multiple email addresses. Emails are individually sent so none of the recipients will see the addresses. Select letters to attach (letters can also be automated with SX3). Select contracts and agreements to attach from your list of customizable templates. Click on "Send" and your entire Loan Modification or Short Sale package is sent via email to the Lender (or any other party). What do you do when a Client calls in with a question about a case? Do you need to search through a file to find a folder, then search for an specific document? Are you outsourcing your negotiation services with individuals who work from out of your workplace? How do you send them the docs every time you need to update a file? When you send a document by fax or email to the Bank, do you need to stamp the Name of the Client, SSN, Address, etc on each page? Have you ever lost one of your Client's docs? With SX3, all you need to do is to receive your Client's docs and scan them directly into the database or import them directly into the software. You do not need to rename or move files from one folder to another. SX3 allows you to scan the documents with a simple click, recording the docs in the database and adding a header (which can also be customized) with the fields that you specify. Paper driven Companies are not efficient and unless you devote a great deal of time auditing your cases, it is almost impossible to generate up to date reports. Note: the scanner must use a TWAIN driver. The TWAIN driver is the most popular driver available. English and Spanish user's interface & Websites. SX3 Software offers complete English and Spanish user interface, selectable per user, this way if a user feels better using the software in Spanish, all what the user needs to do is to click on "Spanish" and the entire system will change menus, messages and screens to Spanish. Click on that icon again and the system will be back to English interface, that simple! Import your data from your existing software or lead vendor. Whether you want to import data from your existing application or from Leads providers, SX3 Software offers unlimited capabilities to import data. You can create and save unlimited importing rules that allow you to import data records from Microsoft Excel, Word, Text (TXT) or CSV files. You can specify the order and content of the columns on each file, specify the field separator (Tabs, commas, other) and save the importing rule for future use, all with simple click on our server based application. The benefits of working with an established software company. With our unique interface and feature rich software, we rapidly became the standard software of all major Loan Modification and Short Sale Companies and Attorney based firms. We improve our applications constantly with new features to adapt them to the changes of the industry, adding reports and new features. We provide Class A tech support. We offer a cutting edge solution for this booming business. We offer the first complete and intelligent software ever created for this segment of the financial industry on a windows based platform, so you can host your data, not relying on web hosting companies that can lose your data! We are a staffed company with a team of well trained professionals that provide Class A technical support to our Clients. SX3 Loan Mod & Short Sale is not an adaptation of an existing application; we have put 12 years of experience developing large scale databases for different business types around the world to develop this solution from scratch. Call us today to schedule a personalized live online demo of the SX3 Loan Modification & Short Sale software. We DO NOT do webinars with attendees from multiple Companies, we do our demos person-to-person, in private sessions. Our knowledgeable software specialists will show you the many ways SX3 Loan Mod & Short Sale software can streamline the processing of your cases and the supervision of your employees. Toll free 1-888-940-8084 x 201 or send an email to info@SX3software.com to schedule a live online private demo of this software. Generate HAMP Pre-Qualification Analysis that sell for more than $500 in minutes! The most powerful, flexible and manageable Loan Modification software available. Download & install your software in minutes, the same day! Copyright 2011 SX3software LLC - All rights reserved. The boxes of the products are illustrative. products are delivered digitally via download.